You may well be asking, "What is a journeyman"? Well it′s origins go back a long way, think medieval trade guilds like the wheelwrights, blacksmiths, armourers or masons. To start off in one of those trades you did a seven year apprenticeship. On completion you could then go off on your own to seek employment and improve your skills, this was the "journeyman". Many journeymen would stay as employees but a few, if accepted as a master craftsman by their guild, would set up in business and take on their own apprentices. Well I am not quite medieval but I did my apprenticeship in marine engineering a long time ago. Firmly stuck at the journeyman stage but mostly travelling by the internet these days. It is a good job that there are plenty of master craftsmen out there with web-sites for me to learn from. That′s me in the photo, John Waterhouse, would be model engineer and home workshop user. I live in Buckinghamshire in the UK. I have had an interest in things mechanical for as long as I can remember and have been on-line since the days of dial up modems, so I am not exactly new to engineering or the internet but probably need a lot more practice at both. My particular interests are stationary steam engines and model boats, havn′t built many of either but keep trying. Stirling and vacuum engines I find fascinating and I have managed to get a few running although they always refuse to work if I want to make a video! Workshop "improvements" are a necessity and you will find a few of my projects in the menu or from the site map. Having enjoyed visiting other engineers on-line workshops I thought it only right to invite you to visit my own workshop. So being interested in web design I created this website. 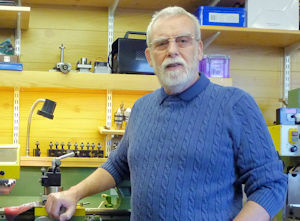 The Journeyman′s Workshop is based in a typical model engineers shed which I built many years ago. The workshop has seen many changes and at one time included both a darkroom and the "potting shed". The workshop has been on-line in one form or another since 2007. The original pages are reviews of my lathe and milling machine. There are several pages of modifications and additions to the workshop equipment, there are a few models to build and plenty of other engineering and marine related articles. There are several info pages with drilling, tapping and machining data and tables. My latest interest is to discover a bit about Fused Deposition Modelling and I have detailed building my 3D printer kit. You can contact the Journeyman by e-mail or leave a comment in the Latest News section (When comments are switched on for a new post). As mentioned earlier there is a vast wealth of information and help freely available on-line at the many excellent model engineering and wood-turning websites. I have included links to some interesting sites throughout the Journeyman′s Workshop and to save you hunting for them they are all on my Collected Links page.